Student and his mom brought to tears by the note a teacher handed out before a big test. The pressure on students to take constant standardized tests grows every year, so when one teacher handed out a letter to students reminding them that they are, y'know, people, it reduced one student and his mom to tears. Rylan got in the car today and told me he was embarrassed because he cried at school. I asked him what upset him, and he told me he cried because he was happy about a letter his teacher gave his class before they take ISTEP. Needless to say, when I read it, I cried too. We need not just more teachers like her, but also more people like her in this world. "These tests do not define you. There are many ways of being smart. YOU are smart! YOU are enough! You are the light that brightens my day and the reason I am happy to come to work each day. So, in the midst of all these tests, remember that there is no way to "test" all of the amazing and awesome things that make you, YOU." It's worth noting (again) that the teacher wasn't dismissing the test or telling kids that they'll be amazing even if they don't study. 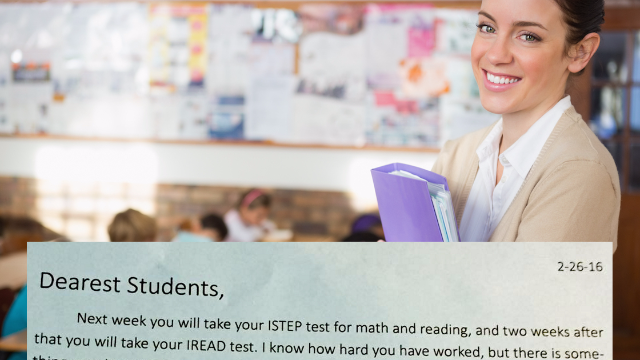 She was just reminding them that there's a lot more to them than the ISTEP (or whatever the version is in your state). Martin said that she wished there were more teachers like her son's, but it's safe to say a lot of adults could use this reminder, too. Your salary may not be all that and a bag of chips, as the kids once said, but maybe you're a good parent and you volunteer and you can do really good impressions of actors. At the very least, there's a good chance more people would like to hang out with you than noted awful rich person Martin Shkreli.